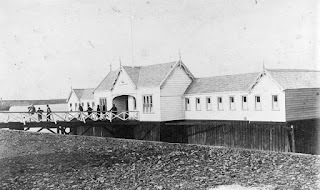 One of the first fenced swimming baths in Auckland was around an area of shoreline at Smales Point. In the 1860s men paid a small fee to swim there – naked, as was customary at the time. 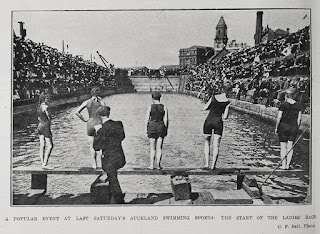 Women were not allowed to use the Smales Point pool but were able to swim for a few hours a day at the Britomart Baths, during which time men were excluded. 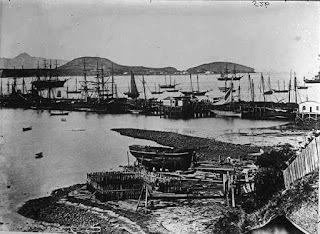 Ref: James D Richardson, Auckland harbour, 1864, Sir George Grey Special Collections, Auckland Libraries, 4-526. In 1881 Auckland Council opened salt water baths on Custom Street where, once again, the sexes were strictly segregated. Women were permitted to use the baths for two hours each morning, and this was extended to include two afternoons a week. 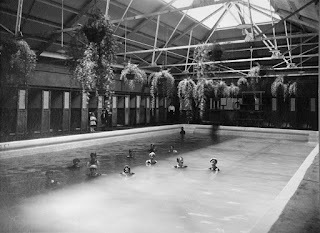 However, demand for more hours for women increased until in 1885 Council added a women’s-only pool to the facility. Ref: James D Richardson, Auckland Saltwater baths, 1867-1890, Sir George Grey Special Collections, Auckland Libraries, 4-906. By the 1890s people began swimming when visiting beaches – rather than just promenading or picnicking. The Council of the time did not support this development as it was difficult to police beaches to ensure men and women weren’t swimming together. According to Stephen Barnett & Richard Wolfe’s book, At the beach, the Devonport City Council said it was definitely “not in favour” of women and girls even swimming at all, and limited the hours men could bathe to before 8:00 am and after 6:00 pm. Mixed bathing was initially forbidden. 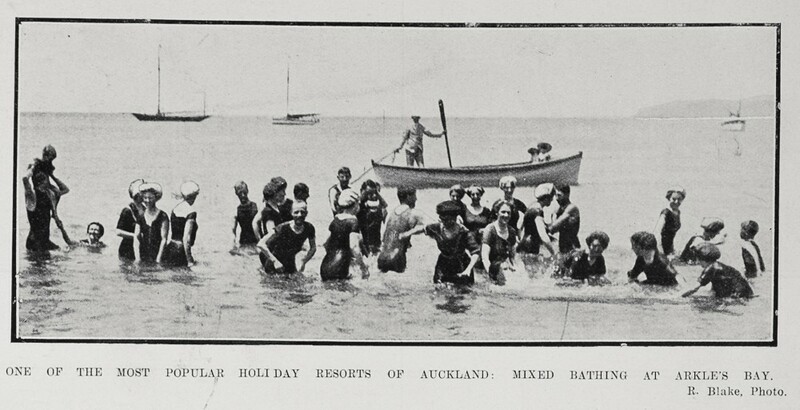 Nevertheless, beach-going increased and mixed bathing gradually became more common – although the Auckland Weekly News still felt it necessary to point out its presence in this caption to a picture of a bathing group at Arkle’s Bay in 1913. 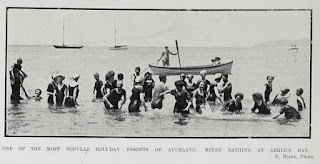 Ref: R. Blake for the Auckland Weekly News, Mixed bathing at Arkle's Bay, 23 January 1913, Sir George Grey Special Collections, Auckland Libraries, AWNS-19130123-10-4. 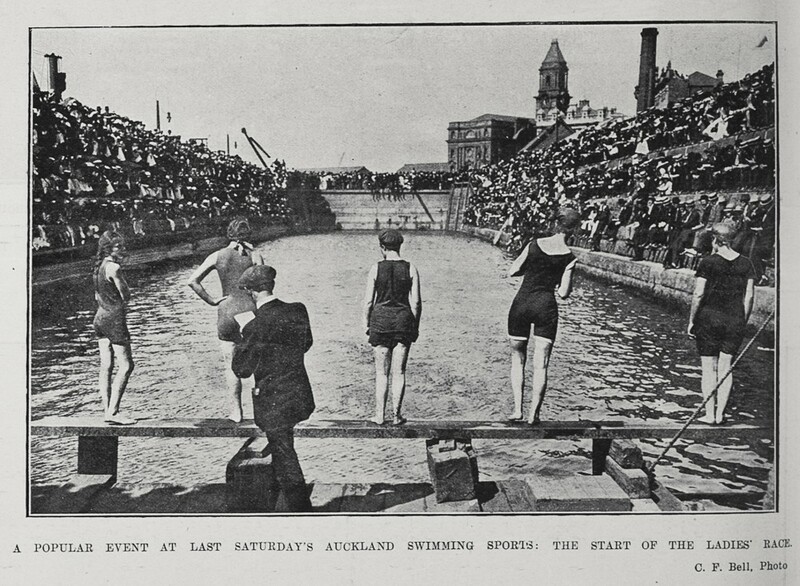 The dry dock near the bottom of Albert Street was sometimes used as a pool for swimming competitions and this 1912 contest shows women competing without any moral panic on behalf of the authorities. Ref: C.F. Bell for the Auckland Weekly News, A popular event at last Saturday's Auckland Swimming Sports, 8 February 1912, Sir George Grey Special Collections, Auckland Libraries, AWNS-19120208-16-4. Although swimming at the beach had become more acceptable, demand for swimming baths continued to grow. 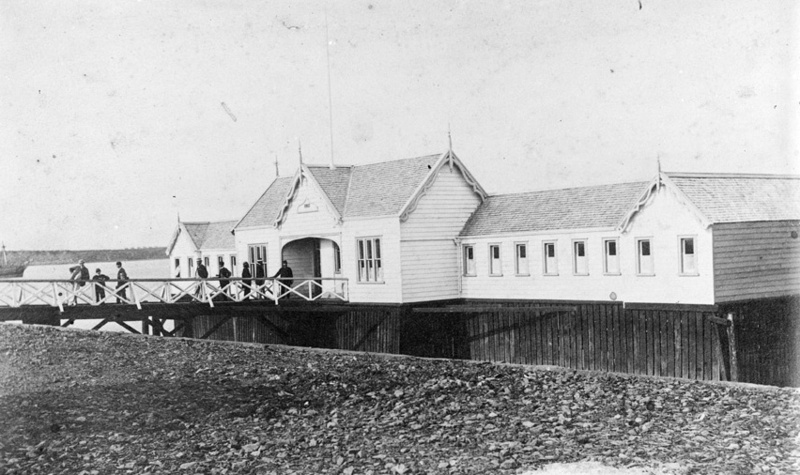 In 1912 Council opened the Shelly Beach Baths, a salt water tidal pool where mixed bathing was allowed under very strict rules. Over 32,000 people used the pool in the first four months. Ref: Henry Winkelmann, Shelly Beach Baths, 5 July 1914, Sir George Grey Special Collections, Auckland Libraries, 1-W215. Two years later, Council opened the Parnell Baths, one of the biggest in the Southern Hemisphere - but its amenities were basic, it had an unconcreted bottom, and valves in the seaward wall controlled filling and emptying with sea water. The water quality was so poor that when a bather died in the pool in 1919 it was difficult to find his corpse in the murk. 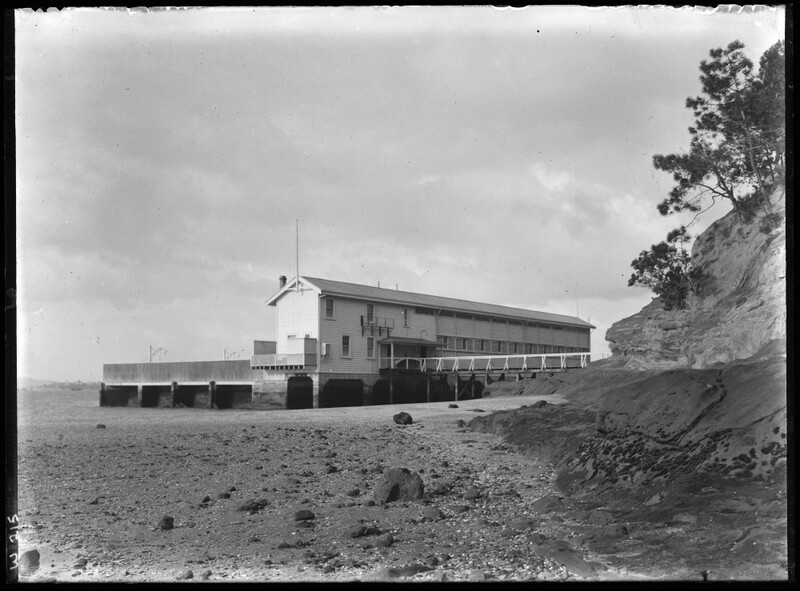 Ref: James D Richardson, Looking west across the Parnell Baths and Judges Bay, 1920s?, Sir George Grey Special Collections, Auckland Libraries, 4-7115. The Tepid Baths in Hobson Street also opened in 1914. These offered 12 slipper baths with a choice of hot or cold, fresh or salt water. The slipper baths were particularly popular for people living in the inner-city who did not possess baths, and by the 1930s high demand led to their number being increased. The facility also had two heated salt water pools – the larger one for men, and the smaller one for women. Ref: Swimmers at the Tepid Baths, 1920s, Sir George Grey Special Collections, Auckland Libraries, 7-A565. it is my understanding that the Parnell Baths are the last of the Saltwater Baths in Auckland, is this correct? 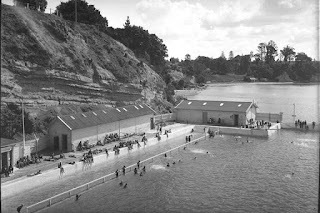 According to David Pointon's book mentioned above the Shelly Beach baths closed in 1956 and in 1974 the Tepid Baths switched from salt to fresh water.